A full on Primark outfit (excluding the underneath vest obviously...), both of these are new additions to the wardrobe. 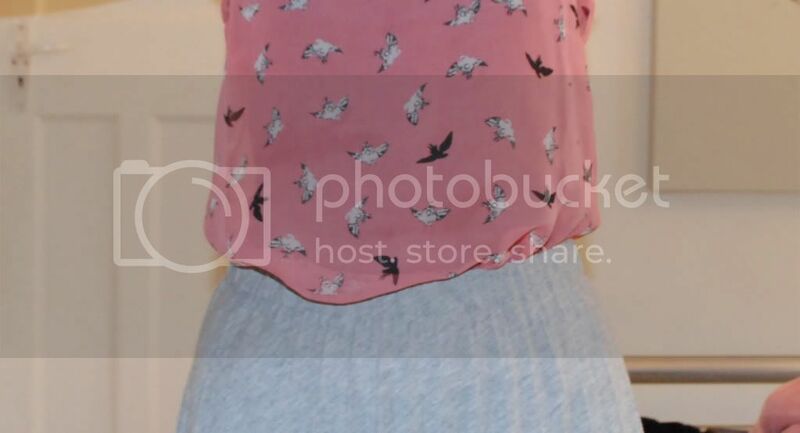 I love the detailing on the blouse – the black lace inset on the yoke (near the neckline) and the bird prints. There’s buttons on the back as well, which I forgot to photograph (never mind), which makes it even cuter in my opinion. Hurts to sit back on though as they dig into you. As for the grey maxi skirt... As much as I adore it, I’ve noticed that it’s actually quite see through. You can see the silhouette of my legs as I move if the sunlight hits it just right. Not too worrying, but it's bad enough. The general fit is really nice though, with the elasticated waist and pleats that sit nicely above my hips. I'm currently in Holland now, visiting my brother, sister-in-law and baby niece Emily, who is just the cutest. It's very relaxing here and I'm enjoying spending time with the family that I don't get to see very often! Emily seems to love necklaces and my hair at the moment. My hair is being pulled out and I'm being strangled by my necklace. She also likes to point at me a lot, as if to say "who the bleedin'ell are you?" Good stuff. We're celebrating her first birthday on Saturday (even though it's not for another 2-3 weeks yet) so that'll be really nice before we leave on the Sunday.